The UC-321 Series is a sleek stylish precision scale that offers quick, accurate readings. 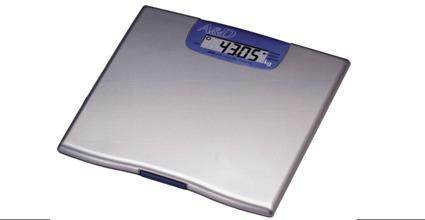 The UC-321 scale (150kg x 50g) has Target, Memory and BMI modes. The UC-321 is a precision personal health scale capable of accurately displaying sensitive changes in body weight, by as little as a 100g. A&D Medical ushers in a new wave of personal scales to the market. The Precision Scale is a sleek stylish unit that offers more precise readings and functionality than those offered from traditional scales. This scale provides your weight in 100g increments for precise information. In addition, the scale includes a built-in memory function for you to record up to 31 readings to track your weight history. With this scale, you are also able to set a target weight to give you the difference between your actual and target weight. An accurate and precise scale specifically designed for telemedicine applications.The UC-321PC, UC-321PBT, UC-321PL series provides highly accurate and precise measurements for telemedicine applications. These scales are one of the thinnest and lightest scales on the market. Measuring less than 1” thick, it is easy to step on and store. This sleek and stylish unit offers more precise readings and functionality compared to traditional scales. Available with wired or wireless communications.